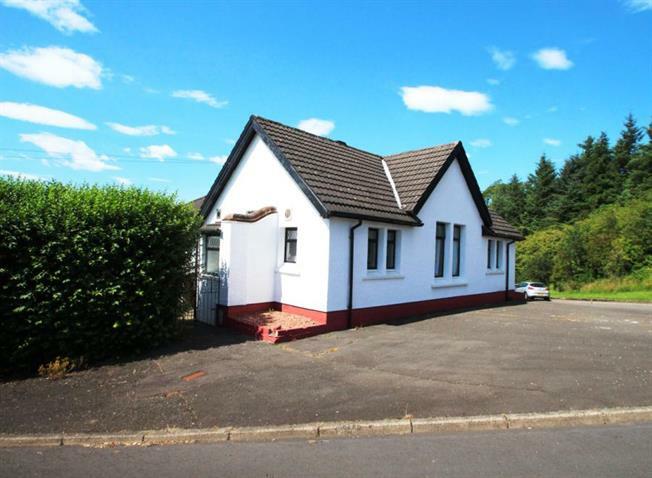 3 Bedroom Detached House For Sale in Strathaven for Offers Over £200,000. Sitting elevated with breath-taking views over the heart of Strathaven, this is a unique bungalow perfect for a large range of buyers with a south facing garden with beautiful outlook. The property sits in its own secluded space with parking right at your front door. The property comprises welcoming porch into reception hallway with impressive real wood finishes. The main reception lounge has a wonderful double aspect view windows giving an impressive view right over Strathaven, with gorgeous traditional fireplace and features what a stunning entertaining room, French doors give access to adjoining dining room where the sunlight flows into brighten the room with french door access to the enclosed rear gardens. The dining room links onto a further cosy family room with a leaded glass feature window. The kitchen is well equipped with wall and base mounted units and plenty of work and storage space, with the added benefit of a utility room linked on. Many windows surrounding the kitchen bring in the best of the light and direct access to the rear is afforded by another porch. The property is enhanced by Three bedrooms, master bedroom one has a stunning large window brightening the room with built in storage, original fire place is behind the storage and could be recovered to enhance this bright room. Bedroom two also has an original fireplace which has been covered over, again something that could be brought back to further enhance the character of this beautiful home. Bedroom three has built in mirrored wardrobe to provide additional storage. The home also has recently upgraded separate shower room and a bright and good sized three piece bathroom. Features include gas central heating and double glazing, and the added benefit of a detached single garage. This property has masses of potential wither it is left with the original layout, or the property could also be extending up the way (subject to planning) and relaying the whole of the property, as the floored attic space already has a window in place and great head height. The possibilities are endless with this property and the stunning south facing garden and impressive views really need to be seen to fully appreciate this peaceful and traditional style home. Viewing is advised to fully appreciate this beautiful property. Strathaven is highly regarded as a charming market town located south of East Kilbride and Hamilton. The area offers excellent shopping and sports facilities including swimming baths, bowling clubs, golf courses, public parks and country walks. Strathaven has a wide variety of shops within the village and a variety of restaurants, pubs, cafes and a large Sainsburys. The area is sought after for its popular primary and secondary schooling catchment, its fantastic community events and for those commuting, with excellent road links to the surrounding towns which include East Kilbride, Hamilton and also links to the M74, M77 and M8 motorway networks which connect Lanarkshire to Glasgow, Ayrshire and Edinburgh.